The last time I updated the OpenGeneral page the game was at 0.90.32.0, it is now at 0.90.38.5. The version change doesn’t appear significant – but as seems common with open source projects, the version numbering is very conservative – especially when compared to some commercial software which throw around new version numbers like candy. Lets take a look at some of the changes since 0.90.32.0, you can view the full change list here. The biggest enhancement is the loads of bug fixes and tweaks that have been made. 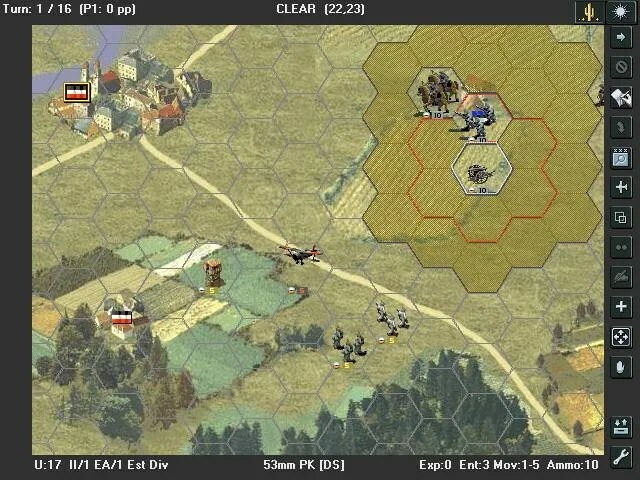 0.90.32.1 – Bridge units can work on hexes with blown bridges again and movement cost is 2 x road-cost. 0.90.32.3 – New trigger type to raise a specific unit type. 0.90.32.5 – New trigger type to raise a specific proto unit. 0.90.32.8 – New option to download all campaigns for any efile. Added a new terrain type: shallow. 0.90.33.0 – Option to use maps made by tiles. 0.90.33.4 – Enhancements to AI. 0.90.36.0 – New trigger added to end turn. 0.90.37.0 – Up to 800 total units can be defined. Next story Operation Barbarossa Updates. Previous story 0 A.D. Releases Alpha 17 Quercus.